1. Schuessler WW, Schulam PG, Clayman RV, et al. Laparoscopic radical prostatectomy: initial short-term experience. Urology 1997; 50:854. 2. Guillonneau B, Vallancien G. Laparoscopic radical prostatectomy: the Montsouris technique. J Urol 2000; 163:1643. 3. Abbou CC, Salomon L, Hoznek A, et al. Laparoscopic radical prostatectomy: preliminary results. Urology 2000; 55:630. 4. Rassweiler J, Sentker L, Seemann O, et al. Heilbronn laparoscopic radical prostatectomy: technique and results after 100 cases. Eur Urol 2001; 40:54. 5. Kavoussi LR, Schuessler WW, Vancaillie TG, et al. 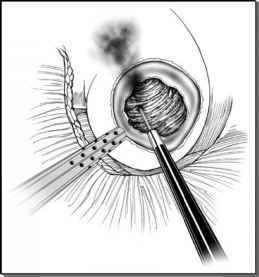 Laparoscopic approach to the seminal vesicles. J Urol 1993; 150:417. 6. Dahl DM, L'esperance JO, Trainer AF, et al. Laparoscopic radical prostatectomy: initial 70 cases at a U.S. university medical center. Urology 2002; 60:859. 7. Dubernard P, Benchetrit S, Chaffange P, et al. Prostatectomie extra-péritonéale rétrograde laparo-scopique (P.E.R.L) avec dissection première des bandelettes vasculo-nerveuses érectiles. Technique simplifiée—à propos de 100 cas. Prog Urol 2003; 13:163. 8. Stolzenburg JU, Do M, Pfeiffer H, et al. The endoscopic extraperitoneal radical prostatectomy (EERPE): technique and initial experience. World J Urol 2002; 20:48. 9. Raboy A, Albert P, Ferzli G. Early experience with extraperitoneal endoscopic radical retropubic prostatectomy. Surg Endosc 1998; 12:1264. 10. Bollens R, Vanden Bossche M, Roumeguere T, et al. Extraperitoneal laparoscopic radical prostatectomy: results after 50 cases. Eur Urol 2001; 40:65. 11. Bollens R, Roumeguere T, Quackels T, Vanden Bossche M, Zlotta AR, Schulman CC. Extraperitoneal laparoscopic radical prostatectomy: Brussels technique. Contemp Urol. In press. 12. Cathelineau X, Cahill D, Widmer H, et al. Transperitoneal or extraperitoneal approach for laparoscopic radical prostatectomy: a false debate over a real challenge. J Urol 2004; 171:714. 13. Hoznek A, Antiphon P, Borkowski T, et al. Assessment of surgical technique and perioperative morbidity associated with extraperitoneal versus transperitoneal laparoscopic radical prostatectomy. Urology 2003; 61:617. 14. Van Velthoven RF, Ahlering TE, Peltier A, et al. Technique for laparoscopic running urethrovesical anastomosis: the single knot method. Urology 2003; 61:699. 15. Schuessler WW, Vancaillie TG, Reich H, et al. Transperitoneal endosurgical lymphadenectomy in patients with localized prostate cancer. J Urol 1991; 145:988. 16. Sayad P, Ferzli G. The extraperitoneal approach and its utility. Surg Endosc 1999; 13:1168. 17. Hoznek A, Salomon L, Olsson LE, et al. Laparoscopic radical prostatectomy. The Creteil experience. Eur Urol 2001; 40:38. 18. Hoznek A, Salomon L, Rabii R, et al. Vesicourethral anastomosis during laparoscopic radical prostatectomy: the running suture method. J Endourol 2000; 14:749. 19. Guillonneau B, Rozet F, Cathelineau X, et al. Perioperative complications of laparoscopic radical prostatectomy: the Montsouris 3-year experience. J Urol 2002; 167:51. 20. Nadu A, Salomon L, Hoznek A, et al. Early removal of the catheter after laparoscopic radical prostatectomy. J Urol 2001; 166:1662. 21. Rassweiler J, Sentker L, Seemann O, et al. Laparoscopic radical prostatectomy with the heilbronn technique: an analysis of the first 180 cases. J Urol 2001; 166:2101. 22. Clavien PA, Sanabria JR, Strasberg SM. Proposed classification of complications of surgery with examples of utility in cholecystectomy. Surgery 1992; 111:518. 23. Abreu SC, Gill IS, Kaouk JH, et al. Laparoscopic radical prostatectomy: comparison of transperitoneal versus extraperitoneal approach. J Urol 2002; 167:19. 24. Stolzenburg JU, Truss MC, Do M, et al. Evolution of endoscopic extraperitoneal radical prostatectomy (EERPE)—technical improvements and development of a nerve-sparing, potency-preserving approach. World J Urol 2003; 21:147. 25. Bollens R, Roumeguere T, Vanden Bossche M, et al. Comparison of laparoscopic radical prostatectomy techniques. Curr Urol Rep 2002; 3:148. 26. Schulam PG, Link RE. Laparoscopic radical prostatectomy. World J Urol 2000; 18:278.